Each unduplicated artifact present is worth 5 points. Makes parallel use of opponent's Palor Toff cards. Textual description about 5 bonus points (you score points, when you play or use this card). 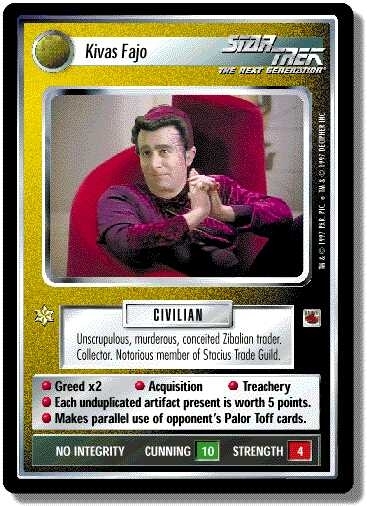 Characteristics: "Continuing Mission"-related cards, "affiliation", bonus points, matching commander. “NO INTEGRITY” on this personnel is an undefined attribute. An “unduplicated artifact” is one that is not duplicated anywhere in play. An artifact just earned is not present unless it joins the crew or Away Team. Making “parallel use of opponent’s Palor Toff” means that each time your opponent plays Palor Toff - Alien Trader, you must also use that card’s game text, if possible (i.e., you must retrieve a non-Personnel card from your own discard pile). A Countermanda suspending your opponent’s Palor Toff does not affect your discard pile. There are 24 entries for Kivas Fajo (ST1E 0 UR 11) at the Tradeplace (21 haves and 14 wants). Click here to see all trade list entries for this Ultra Rare card!